Flat Panel Pros installs any TV in any type of configuration. From wall-mounts to standing displays, we customize the installation to fit your needs and the best solution for the room. Our TV installations include hidden wiring and cables as well as connecting the TV with all other devices. Our friendly technicians will stay on after the installation to test that everything works and will train you on using the components. Call today and tell us what you need for your TV or home theater installation in Vancouver, WA or the surrounding Portland Metro area. We stock a large variety of brackets so there is no waiting while we order inventory. 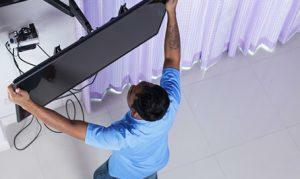 Our technicians show up fully prepared for any type of TV installation. They are accustomed to strategizing even the trickier installations and tight fits. Your flat panel TV is an investment, whether it is a stand-alone or part of your home theater design. Our experienced technicians have the knowledge and expertise to ensure a secure fit. We inspect the wall for reinforcement and use the most reliable brackets available. Our services are licensed, bonded, and insured, so you can feel confident in the services you will receive when you call on us for your TV installation. From helping you make the best selection of TV for your needs and your budget to setting up all your devices and cleaning up before we leave, we are your full-service TV installation company. We also take the time to ensure you know how everything works and can operate it on your own. Call today for complete support and a beautiful display of your TV that looks and sounds great. Get the most from your TV installation in Vancouver, WA!